It’s been a few weeks since I’ve done any attempted poetry. But here’s the newest version of Poetic Archaeology. Our archaeologist’s controlled surface collection is underway. Spring is the best season for this kind of work—at least in agricultural areas. Plowing or disking will bring some buried artifacts to the surface. After a rain, especially a not-too-heavy shower, an archaeologist’s trained eye can catch even the smallest waste flakes left by a knapper fashioning a stone projectile point. Once the crops get taller, it’s harder to see the ground surface and those artifacts. In many parts of the US, agricultural fields often reveal archaeological sites with artifacts covering Native American, European contact, and American history. Our poetically inclined archaeologist has found both Native American hand-crafted stone artifacts, which could be several thousand years old, and more recent machine-made glass, probably bottle fragments from the nineteenth or twentieth century. She’ll study the artifacts in her lab to see if she can pinpoint more exact dates for when they were made. 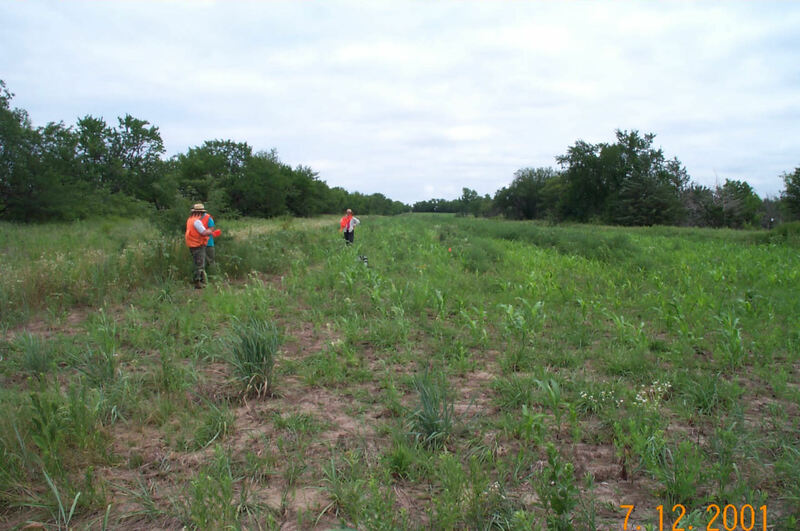 I don’t have a good photograph for a controlled surface collection, but below is a crew shot from an initial survey in a scruffy cornfield somewhere in the US. If you click on it for an enlarged view, you’ll just be able to see the top of a red pin flag in the center of the photo, marking where an artifact was found. I think our intrepid archaeologist is lucky enough to be working in a freshly disked field with no weeds or planted crops. Excellent entry, nice to read that..
A bad day in the field still beats a good day in the lab picking through the residue of a floatation sort. Nice poem. Enjoy the field. This phrase really creates a vivid image “wake to wind-chapped hands” – can really see and feel that. My hands felt dry and cold just writing that line! There’s a lot of history beneath our feet that most people never experience. East Texas was part of some very complex Native American cultures in pre-European times, so the burial mounds in yards aren’t surprising! A lot of archaeologists get their start by finding things like broken pottery and points as children. I really enjoy these posts. Always like learning about something of which I have no prior knowledge (so, another words, a lot of things.) Loved the poem, but I must ask, what’s a knapper? Tried to look it up but not sure I got it right. So that “knapped stone” in the poem is either something like an arrow point or scraper or the debris left over from making such a tool. I think the hardest part of these poetic attempts is making the following description short, informative, and halfway interesting! I will try the Aquaphor! I’m constantly using moisturizer in the winter, and really all year round. Thanks for the definition. You have both entertained and educated me! LOL! But maybe you could then use it on some of the beasties in your other dreams! And a bunch of women sitting around making stone weapons might make some men just a wee bit nervous….! Sounds like a story in there somewhere! I always thought being an archaeologist would be so interesting (part of it was Harrison Ford in Indiana Jones)… but I knew that I didn’t have the patience to slowly piece away at something. I’m glad to hear that you enjoy your work and that it lends meaning to your writing. If lab work drives people away from archaeology (as I mentioned in an earlier comment), Indiana Jones makes a lot of people (girls!) at least try a class! Sadly, I know of few archaeologists who resemble Harrison Ford in his prime. But one of my minor characters in “Death Out of Time” probably comes close…. 🙂 He’s a bit of an homage to Indy, I think. I hope my experience will also add some additional layers of interest to the books. Great poem, I can feel the roughness of the hands. Maddie has done her fair share of controlled surface collections. (And she probably goes through as much moisturizer as I do.) But I don’t think she’s ever written a poem about them. Frankly, I’m surprised that I have. I never thought of doing such a thing before this year. These are fun to do. They make me look at my “day job” in a completely different way. And it probably affects my approach to the novels at some level, too. Well, I definitely enjoy the poetic approach, and you do a really awesome job with them. It’s funny, but I never wrote poetry before I started doing the 100 WC thru Julia’s Place. I feel like they have opened a whole new route of writing for me. And I have started toying around with using them in blog posts, too. I just haven’t gotten around to connecting one to an actual post theme. I don’t want it to be too random or meaningless. Ah, you’re sweet to say that about my ms. I wasn’t sure what you’d think because I don’t know if you prefer sci/fi to read (just based off of the fact you write in that genre). I am up to about page 50 in yours, and I am really getting into it. For someone who does not read sci/fi, much less anything to do with time travel, the fact I’m immersed in your story should tell you how readable it is! And then somehow I came up with the idea of archaeology as poetic subject matter. I’ve never seen anything like that anywhere. (Although, interestingly, someone did a search for “poems about archaeology” that led them to my blog.) I realized that would fit in with some of my characters in the books and my career. So I’m hoping it adds that “extra content” that helps separate my blog from others. We’ll see…. I’m hoping the book will appeal to more than a core sci-fi audience, so your initial views are encouraging! I think the mystery elements add an interesting flavor. I enjoy a variety of genres, even though sci-fi is probably my favorite. At least for now, I consider my other book mainstream. It’s not like the characters communicate between the different universes. We’re really just seeing the similarities and differences in the main character’s life as different choices were made and events took other courses. Maybe an agent/editor would say it’s speculative fiction, but I’ll cross that bridge if I get to it! Long story short—if the story’s good, I’m open to genre (except horror and violent stuff). Does the friend’s mom get to work someplace exotic, or does she stay closer to home? One thing you should keep in mind is that 99% of archaeologists do fieldwork in a single country/area. So she wouldn’t be doing a project in Africa one year and then one in Europe the next. However, she could travel to other countries to do research on museum collections, for example. But her fieldwork will be more localized. She’s got lots of options for her specific work in Africa. She could do work that’s based in the 1700s and deals with the slave trade. Or she could focus on the Middle Ages and some of the African kingdoms of the time. She could work in North Africa and study the Roman connection. And, of course, she could go back hundreds of thousands ago (and more) and do archaeology associated with early human ancestors. For something like that, she’d work with paleoanthropologists who specialize in the fossils while she focus on the sites associated with them. Just a few ideas you can play with…. When you’re ready to really think about it, feel free to drop me an email at jmmcd2009atgmaildotcom. Hopefully I won’t make the archaeology too boring at some point. They probably triggered my interest in it when I was in high school. The shows usually focus on really exotic places, but every now and again, there are some that are more typical of the “average” archaeologist. Telling people I’m an archaeologist is usually a great ice-breaker when I meet them! I find archaology absolutely fascinating. They recently did some bridge excavation near me, and found a buch of really old indian clay pots. So exciting! It must be fun to do that for-real and not just watch on television. It can be fun. Sometimes it’s hot, dirty, exhausting work. But it can be fun. Hopefully I’m presenting it in an entertaining way in the works-in-progress! I never heard the word “knapping”. Nice to learn something. One of my brothers got inspired on one of our camping trips when we were kids and tried chipping (knapping) obsidian. As I recall, it’s done b applying pressure in just the right way – and it is tricky. My brother had a little luck with it. He’s the one who grew up to be a “mechanical engineer, materials option”, so I think his appreciation for understanding the properties of a material played a part there even at that age. Plenty of sunscreen and a wide-brimmed hat should be part of the field clothes. Unfortunately, I know a lot of archaeologists who haven’t done this. You’re correct about the application of pressure. “Pressure flaking” is the archaeological term. And it’s a lot harder than it looks! Obsidian is one of the best stones for making tools out there. A good knapper can get an edge on the tools that is sharper than modern surgical steel implements. Surgery has been done with obsidian knives—not that I’d volunteer to be the archaeologist to make them or have them used on me! But it’s a good way to slice up your hands or do eye damage without proper protection, so I really don’t recommend that anyone go out and try it! Thanks for the follow and comment! I’ve always liked digging in the dirt and discovering little treasures. Maybe I missed my calling 😉 Your haiku was a perfect fit! Thanks, Jeannie! I know traditional haiku are supposed to be about the seasons, but the form seems to work well for me. Future poems might take different forms, but right now, I’m sticking with what works. And haiku really forces me to choose my words carefully. I think that’s a great exercise for any writer.